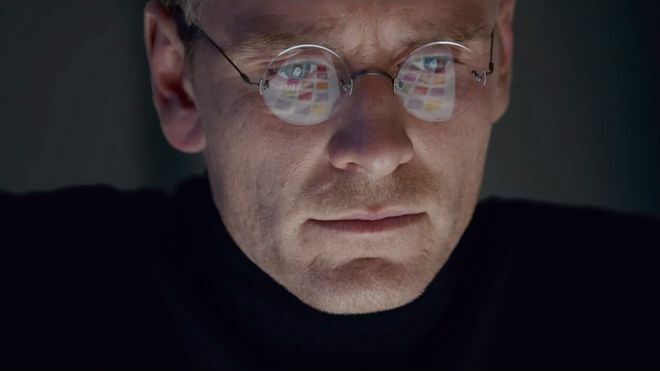 Michael Fassbender as Steve Jobs. The talent from the film took part in a Q&A session following a screening of the movie at the 53rd annual New York Film Festival on Saturday, which was attended by AppleInsider. They all spent time with former Apple CEO John Sculley, company cofounder Steve Wozniak, and original Macintosh team members Joanna Hoffman and Andy Hertzfeld. And while star Michael Fassbender obviously could not spend time with the late Jobs, he said getting to know those around him helped immensely to shape his portrayal of the iconic Apple cofounder. "The one thing that stuck with me was how much of an impression that he made on these people, obviously when he was alive, but since he passed away, you could see that he was still very much present in their lives," Fassbender said. "Even if the relationships were difficult, there was a sadness and there was a love there, that I thought was pretty clear." Some have criticized the film's aesthetics by noting that Fassbender looks nothing like Jobs. Fassbender, it turns out, completely agrees with that assessment. "Obviously, I don't look anything like Steve Jobs," he said. "That was the first thing I said to (director) Danny (Boyle). 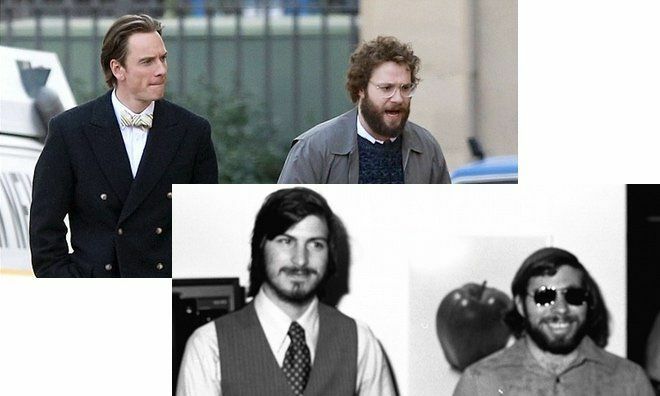 I was like, 'Well, Christian Bale looks a lot more like Steve Jobs than me.'" Bale was originally in talks to portray Jobs, but Boyle explained to Fassbender that his intent was to capture "the essence of the man," rather than worrying so much about his physical appearance. "From the beginning, the approach was to just not try and emulate that look or copy that look," Fassbender said. There were still obviously some efforts to make Fassbender look more like Jobs, including wardrobe choices matching the three time periods the movie takes place in, and the use of brown contact lenses to make Fassbender match Jobs's eye color. 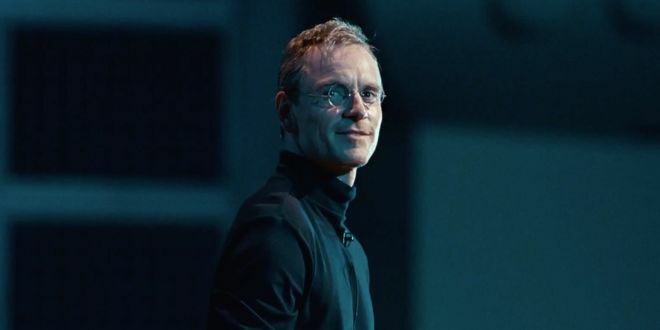 As production of the movie proceeded, Fassbender and Boyle even debated whether or not to have the title character wear his well known black turtleneck, jeans and New Balance sneakers for the third act, set in 1998 at the unveiling of the first iMac. But the two eventually concluded that the audience would want to see Jobs portrayed in his most iconic appearance for the film's finale. "It kind of developed as the third act came along," Fassbender said. "It was very organic." 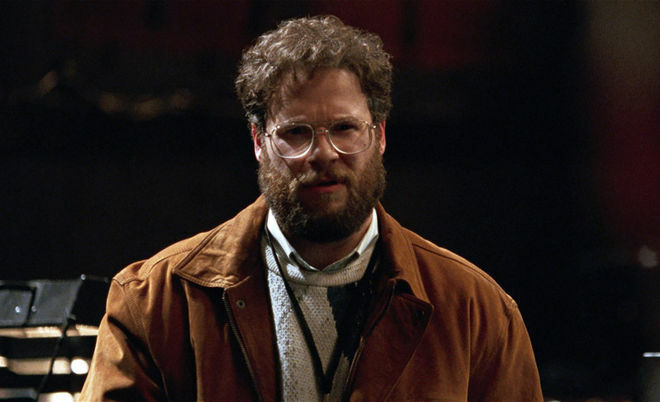 Seth Rogen, who portrayed Wozniak, said he appreciated the time "Woz" spent with him, but in the end, the actor wasn't worried about whether his performance would please him. "My job, first and foremost, was making my boss, who was Danny (Boyle) happy. Woz wasn't paying me. I was hired by these guys," Rogen said onstage with his costars, director, and writer Aaron Sorkin. As an actor doing a job, Rogen said that if the filmmakers asked him to completely disregard everything he learned about Woz, he would have done it, trusting their artistic vision. "I don't want to get fired, and Woz can't fire me," he joked. Seth Rogen as Steve Wozniak. Rogen noted that in the end, Wozniak is "very happy" with the final product, which did please him to hear. He told the audience at the Walter Reade Theater that it would be "terrible" if Wozniak hated him. "Accuracy isn't necessarily creatively the thing that portrays someone the best," Rogen said. 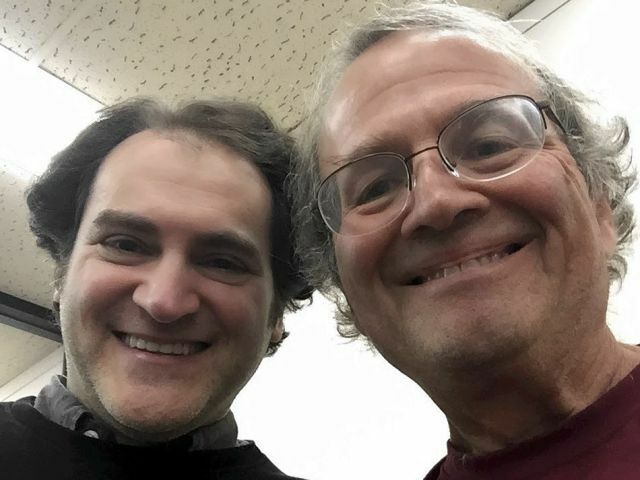 Hertzfeld was also very gracious to Michael Stuhlbarg, who portrays him in "Steve Jobs." The actor said that he spent many hours with Hertzfeld, including a visit to his house, meeting his wife, and eating together. Hertzfeld told Stuhlbarg of the "love and mutual respect" that he and Jobs had for one another. The Mac co-creator also found it very challenging when he wanted to stay around Apple longer. Even though Jobs felt differently, he would still constantly check in with Hertzfeld after he left Apple, Stuhlbarg said. Michael Stuhlbarg, left, and Andy Hertzfeld, right. Via Re/code. "He couldn't have been kinder to me, and he was really generous to with his time," Stuhlbarg said of Hertzfeld. "I heard from him today, which was delightful. "He remained, for Steve, sort of a moral center, in a life that seemed quite complicated for Mr. Jobs, I think. Andy was always there for him to check up with, periodically. And he would, just show up on his doorstep."